Recognized Elaine Parham, retired teacher with a plaque to honor her thirty-three years of dedicated service to the school district. Recognized Logan Clark with a Smackover High School Outstanding Leadership Award, praising him for his character, compassion, and willingness to do the right thing. Listened to a report regarding changes to the ALE program for the 2013-2014 school year. Approved a policy to be added to the student handbooks. Tabled the approval of the district budget and the special education budget. 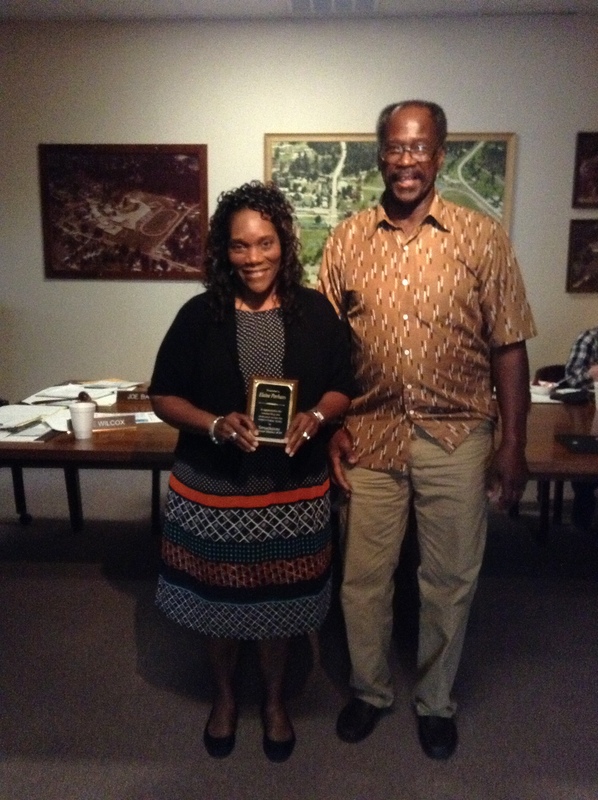 Mrs. Parham with Jerry Hegwood, Smackover School Board Vice-President. 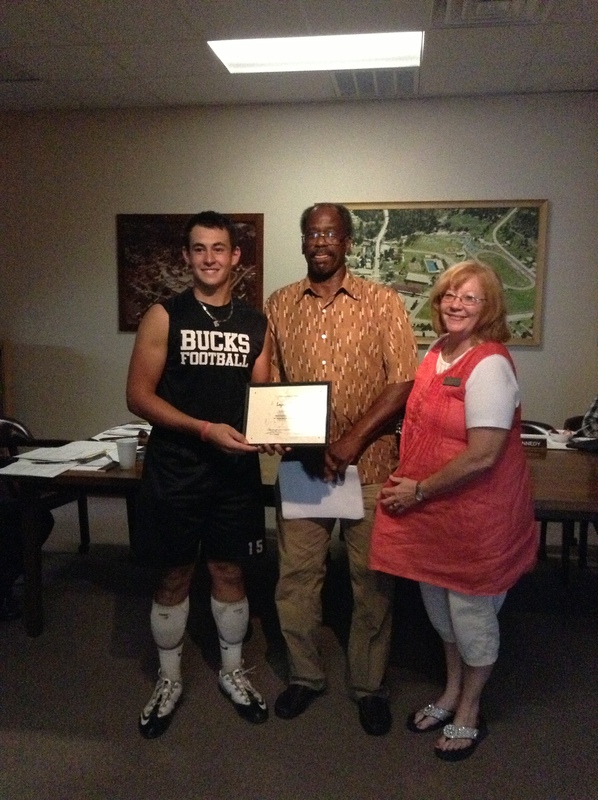 Logan Clark with Jerry Hegwood and Jan Henderson, High School Principal. Posted in Buckaroo Board on September 30, 2013 by The Buckaroo Blog. Wednesday, October 2, is picture day at Smackover Preschool! All students will have their pictures taken on that day. These pictures will be included in the elementary school annual. Proofs and order forms will be sent home in a few weeks to parents so that pictures may be ordered. Posted in Buckaroo News on September 27, 2013 by The Buckaroo Blog. In preparation for the 2013-2014 school year and the occurrence of influenza, the Arkansas Department of Health is currently working with school districts to schedule and plan for flu vaccine clinics in schools. The flu shot clinic will be held October 16, 2013 in the Hobgood Auditorium. If you want your child to receive an injection or nasal spray, please fill out and return the appropriate paperwork. Only those with a signed consent will participate in this event. To facilitate the paperwork involved in receiving a parent’s consent for the student to receive the vaccine, a Family Education Rights to Privacy Act consent form is attached to this letter. Please sign and return all attached forms. These consent forms must be returned to the school nurse by Friday, October 4, 2013. If you have any questions. please call the Union County Health Department at (870) 863-5101. For local information, contact school nurses Amy Walthall or Kari Gatewood at 725-3601. Posted in Buckaroo News on September 26, 2013 by The Buckaroo Blog. 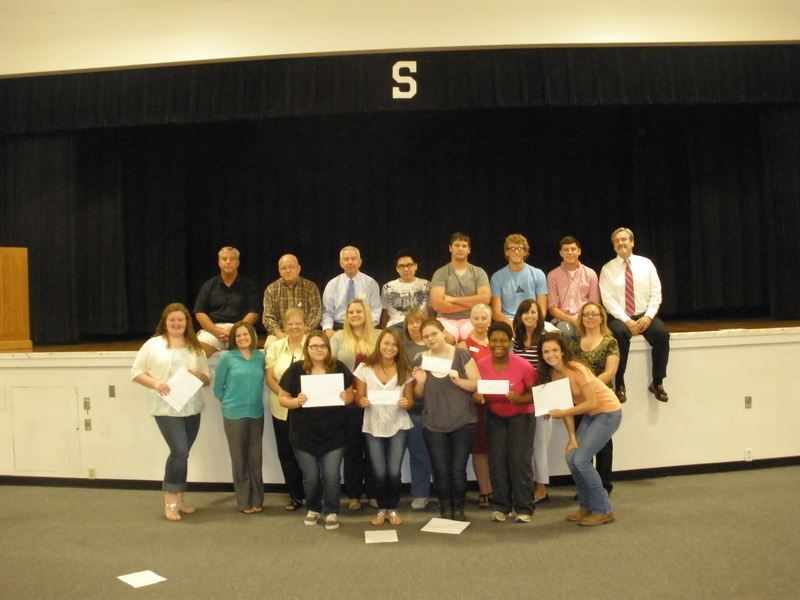 Smackover High School held their annual Arkansas Advanced Initiative for Math and Science (AAIMS) assembly on Wednesday, September 11, 2013. Students were recognized and presented $100 gift cards for passing their respective AP end-of-course exams with a 3 or better score. In 2013, SHS had 44 students participating in AP classes and almost 30 percent passed their exam. This was a 10% increase from the previous year in the number of students making the passing score. With these passing scores, students are able to earn college credit. Also present for the assembly were Mayor Bobby Neal, Smackover High School AP Coordinator Crystal Yeager, AAIMS representative Missye Tyler, AP Calculus Teacher Amber Miller, Smackover State Bank Officers Bob Willett and Jim Yeager, along with Smackover School Board members Lynn Kennedy, Heather Preston, and Chris Long. Posted in Buckaroo News on September 25, 2013 by The Buckaroo Blog. SHS HOSA club(Sports Medicine) is selling T-shirts to raise money to attend conferences in the Fall and Spring. There are 4 different designs to choose from. Please fill out the appropriate form and turn it in by noon on Oct. 1, 2013. Payment is due upon ordering the shirt. Make checks payable to SHS HOSA. Please get your order forms to Mrs. Lois Nutter in the high school office. Posted in Buckaroo News on September 24, 2013 by The Buckaroo Blog. Smackover High School will celebrate Homecoming on Friday, September 27. 11:00 am – Student Council conducts tours for alumni classes of ’93 and ’03. 11:30 am – Alumni eat lunch in the cafeteria. We will be posting homecoming information, athletic schedules, and other important information on the blog in an effort to keep parents and the community informed about the events occurring in the Smackover School District. Posted in Buckaroo News on September 23, 2013 by The Buckaroo Blog. The Buckaroo Bistro is now open on Tuesdays and Thursdays from 3:20 – 5:00. Your students can come study, read, or just hang with friends. We have light snacks, soda, and water available. The Bistro is located in the former Bruce Drugs Building downtown and is run by Aprile Richardson and Sonia Barker. Posted in Buckaroo News on September 22, 2013 by The Buckaroo Blog.